Forgive us the cynical world outlook, it’s just how we are we’re afraid! Marriage is a bit of paper that says we’re fairly happy for the minute and might stick at it for a bit – right? Well not entirely, there is something nice about the stuffy old tradition, sure it’s far too expensive and we’re rapidly approaching a point where half of them end in divorce; currently 42% and counting, but that still means over half of the time people are still, at the very least, willing to stick with the person they decided to marry. A quick look at musical history tells you that marriage can actually be quite beneficial for ones career, certainly over the years a number of husband and wife duos have produced some excellent records. Tom Waits is arguably the greatest singer-songwriter of all time; we’d certainly try and argue the point, but since he married Kathleen Brennan back in 1980 he’s been a man transformed, co-writing with said wife, he transformed from a loveably grouchy old lounge-singer into the unhinged purveyor of oddities we’ve grown to love ever since. Anyone who saw the excellent biopic Walk The Line knows more than enough about the troubled, but undeniably romantic early days of June Carter and Johnny Cash, but truly where would Johnny be without her? June not only helped him overcome addiction to barbiturates and amphetamines, but toured and performed alongside him, and wrote arguably his most loved track, Walk The Line, alongside the oft forgotten Merle Kilgore. Their story would be remarkable even without the wonderful music it produced, but with a musical legacy, it’s become unforgettable. In recent years less husband and wife duos seem to be popping up, with declining marriage rates and an ever rising average age at which people are tying the knot, this is perhaps unsurprising, that said plenty are still creeping through. The marriage of a Texan boy and a girl from Quebec involves some fairly large relocating but the marriage of Win Butler and Regine Chassagne ended up being good for all of us when it spurred on the sound of Arcade Fire. Yo La Tengo have been going for over thirty years now, and for twenty-eight of those Ira Kaplan and Georgia Hubley have been married, along the way they’ve created an incredible and incredibly long back catalogue. Mates Of State might imply little more than friendship but four years into the proceedings the duo decided to marry, and remain together as both a couple and pair even now. Of course we can’t leave you without reverting to cynicism, so let’s just say Fleetwood Mac, The White Stripes, Abba, Sonic Youth, The Cocteau Twins and Ben Gibbard and Zooey Deschanel and let you work out for yourself whether making music with your other half is worth the risk! Summer Camp are the husband and wife duo of solo artist turned band member Jeremy Warmsley and journalist turned band member Elizabeth Sankey. Distorted battered guitars jangle effortlessly, alongside bright buzzing synthesisers and the whole sound seems to drip in a nostalgia for youth, from a pair who know that it wasn’t all it was cracked up to be, but still wouldn’t change it for the world. London, the capital city of England and the countries musical epicentre! Home to people like the Queen and Chris Evans, also musicians live there, lots of musicians! Wikipedia lists 693 Musical Groups and 705 musicians from London, which we think we can all agree is far too many. The duo formed in October 2009 and signed to Moshi Moshi Records who have released everything the band have released to date. The Young EP landed in September 2010, before their debut full length album Welcome To Condale was released in 2011, followed by a second EP Alwayvs in 2012, and their self-titled second album in 2013, continuing their strict one release a year policy, they put out Beyond Clueless the soundtrack to Charlie Lyne’s teen-movie documentary in 2014, and will release their third album proper, Bad Love on May 25th. Summer Camp is probably one of the most appropriate names a band have ever taken. This is a band who deal in hazy nostalgic visions of youth, but through a wash of sunshine. Interpretations of the drama and pain of growing up, reflected upon many years later by a pair of fully functional adult eyes. Beautiful pairs a low baddy rumble with a meandering synth reminiscent of Metronomy but it’s lyrics play out like the plot to an 1980’s teen flick, “I don’t even care what my friends think” Elizabeth notes and like every teenager who’s said they don’t care about a social situation, it’s very clear that’s a massive lie! She goes on to pinpoint the hero of this particular heartbreak as a man who’s “so beautiful, I need to be close to you” and makes Elizabeth, “wish that I could be cool like you” before noting the rather lovely sentiment, “when I look at you it makes me feel beautiful too.” The whole thing is delivered with the icy cool of someone long removed from a painful situation, the hurt now a distant memory. Elsewhere Sleepwalking has a Strokes meets disco feel that ends up sounding not unlike Arcade Fire, appropriate because there’s something Regine in the tone of Elizabeth’s voice. Her voice is excellent throughout; a very British enunciation with hints of Emmy The Great or even Neil Hannon, but her tones more passionate, recalling Rebecca from Slow Club or the Howling Bells front lady Juanita Stein; the latter reference particularly apt on the jangling 1980’s pop of If You Hate Me. Jeremy’s voice is an underrated force too, whilst not exactly classically beautiful and slightly nasal his delivery, with hints of fellow Londoners The Mystery Jets or Tigercats, does account for some of the albums finest moments. The scuzzy-shoegazing of You’re Gone, which brings to mind Fever Dream, whilst the ode to throwing yourself into dangerous situations, Horizons, is excellent, Jeremy singing, “if you never put your future on the line, everything will just be just fine” as Elizbaeth coo’s the world most bored sounding, “just fine” behind him, it’s rather wonderful! The best moment here though is Run Away, a big bombastic, and heavily 1980’s influenced number, it questions the ideas of influence and fate, “we’re just the product of nothing, just the things that we’ve done” they note, before going as far as to even question the vitality of the music that we love, and of true love in general, “what if the songs you say define you are just the ones you heard first? What if your first love could be your last love if you hadn’t used it as a way to rehearse?” It’s another example of the bands ability to look back on what seemed like the beginning and end of your world as a teenager and realise with the benefit of hindsight that it might not be the end of the world after all! 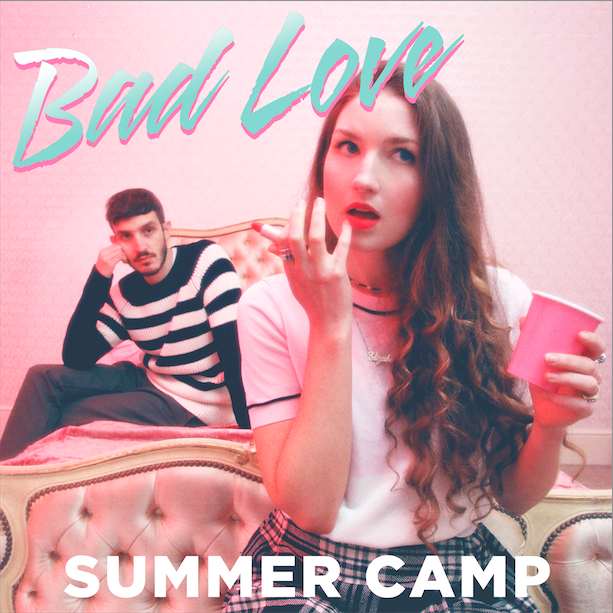 There’s moment here when you wonder if Summer Camp is actually just a ploy to dupe teenagers into buying records, all their tales of love and heartbreak are delivered as cynical pastiches of actual teenage feelings. Though you’ll soon forget about and loose yourself in their world, after all, we were all young once! Bad Love is out May 25th on Moshi Moshi Records. Summer Camp play at Truck Festival and the Y Not Festival, before a date at The Village Underground in September. Great post. I like their sound, Bad Love being the better of the two tracks IMHO. Thanks for exposing me to them. Great observations on successful musical marriages. So true that June Carter saved Johnny Cash, she was also his muse for so much of his career-especially the later American Records era There is a third kind of musical marriage that is both sadly beautiful as well as tragic. That is the lost in love/mutual self destruction type such as Sid & Nancy or Kurt and Courtney come to mind. Thanks Rob – very kind! So true of the doomed marriages – that might be a good idea for another post somewhere down the line!